Watchdog Nation celebrates the passage of three new laws aimed at helping Texans protect their pocketbooks and their privacy. As readers of the Dave Lieber Dallas Morning News Watchdog column know, The Watchdog asked for your help to push state lawmakers into solving five of the most annoying consumer problems in Texas. We promoted five bills in the 2015 Texas Legislature. Many thought little would come of these proposals, which we called the “Good Deal” platform. 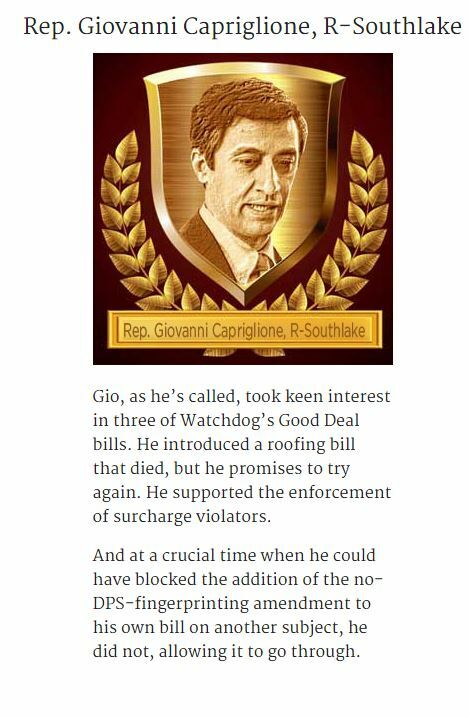 We used as our bully pulpit The Watchdog column in The Dallas Morning News — and, most important, its thousands of readers, some of whom participated in the campaign to help lawmakers who sponsored the bills. These everyday constituents sent letters and emails stating their support. So how did we do in the 2015 Legislature? Three of our five bills passed. Three for five! The Watchdog rarely uses exclamation points, but that’s a .600 batting average, good enough to get into a hall of fame. 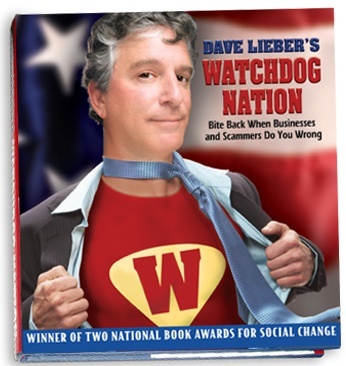 That’s why Watchdog Nation launched The Watchdog Hall of Fame. Six state lawmakers who worked hard on behalf of these five causes are the inaugural 2015 inductees. We’re proud to tell you their names: Sen. Van Taylor, R-Plano; Sen. Kirk Watson, D-Austin; Sen. Charles Schwertner, R-Georgetown; Rep. Jodie Laubenberg, R-Parker; Rep. Giovanni Capriglione, R-Southlake; and Rep. Sylvester Turner, D-Houston. Let’s look at what happened in each of the five areas and give lawmakers Good Deal grades. A key to my Watchdog Nation consumer rights movement is the idea that we should always ask a bunch of questions before making financial decisions. But you couldn’t do that in Texas with your homeowners or auto insurance policies without risking a premium increase. Some companies took advantage of a loophole in the law to penalize customers who made inquiries. No more. 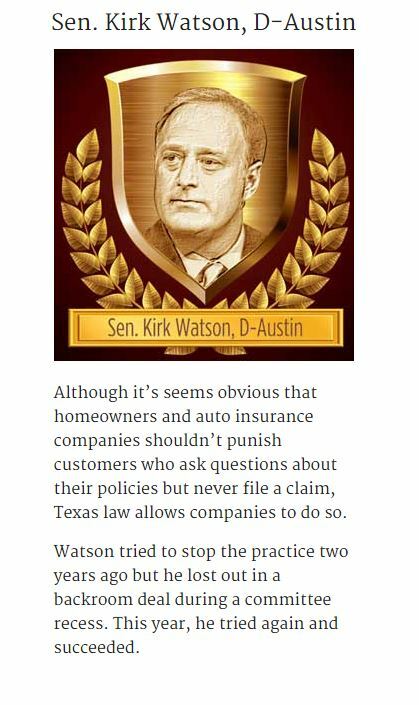 Thanks to Watson, it will be illegal in Texas for auto and homeowners insurance companies to penalize customers who only ask questions about their policies, but never seek actual claims. The insurance industry, in its all-knowing wisdom, decided that simply asking about your policy shows a propensity for accidents. They figure you’ll eventually cost them money. One man I found considered filing an auto claim but in the end didn’t file and never received any insurance money. His premiums went up for five years anyway. Watson tried two years ago to get this law passed but didn’t succeed. This time he succeeded. Support from Watchdog Nation “certainly helped,” Watson spokeswoman Kate Alexander says. The Watchdog sought a licensing system for roofers to weed out the bad guys. When two lawmakers — Capriglione and Rep. Kenneth Sheets, R-Dallas — introduced bills that would create a voluntary certification (Capriglione) or registration program (Sheets) that was weaker than licensing. But still, it was an added step of consumer protection. Unfortunately, neither bill advanced out of House committees to make it to the full House for a vote. Live and learn. The Watchdog is paying close attention. The city of Arlington has taken an extra step to protect its residents from crooked roofers. Last month, the city created a roofers’ registration process that screens roofers who want to work in the city. Priority one for The Watchdog was my idealistic “Retail Electricity Reform Act of 2015.” This proposal had no chance of passage in 2015. The only reason the grade is not an F is because Turner, who is retiring, did what he always does: fight for electricity customers in Texas. He authored a bill that would have eliminated the hated penalty fees for customers who don’t use a required minimum amount of power each month. These fees are especially unfair to the elderly and the poor who try to conserve, then get socked with monthly penalties. These penalties didn’t exist until recently when electricity companies figured out a new way to exploit customers. Turner’s bill failed. Still, he’ll be missed. No one else in the legislature seems to care about helping consumers navigate the confusing retail electricity market. Rates are advertised with and without added fees. Door-to-door electricity salesmen will say almost anything to make a sale. Annoying fees — unregulated — are tacked on to monthly bills by electricity companies. Behind the scenes, electricity companies and their lobbying groups convinced lawmakers that there’s nothing major wrong with the system. Public Utility Commission officials also take the attitude that no major changes are needed. At least my campaign generated attention. Pros and cons were discussed by me and others on radio, on TV and in two energy newsletters read by industry members across the state and nation. I’m disappointed that the power industry doesn’t want to clean up its shady marketing practices. Keep it up, and their credibility will match roofers. 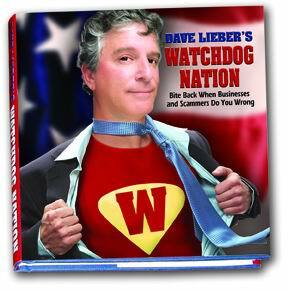 The Watchdog is not giving up. Yes, it’s illegal for retailers and others to add a surcharge penalty to customers who pay with a debit or credit card. Governments are excluded and allowed to charge extra. When somebody complains, merchants get a warning letter from the state. That’s it. 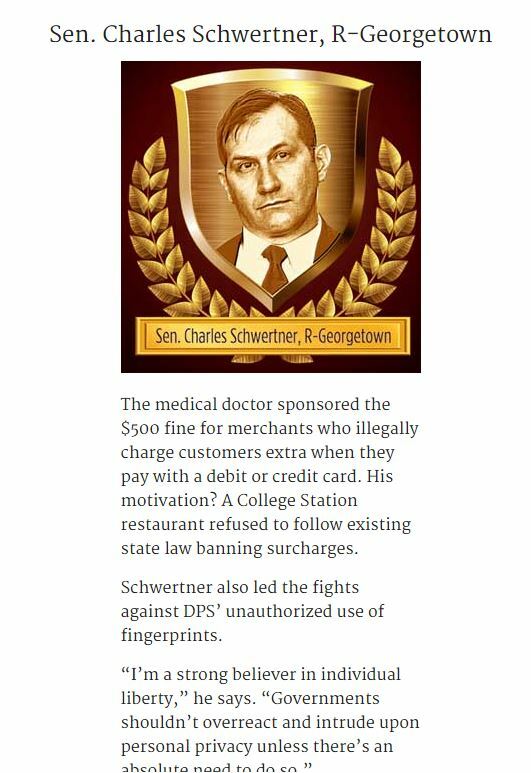 Thanks to hard work by Schwertner, anyone who violates the law will get more than a warning letter. They can expect a $500 fine. The curtain officially comes down on the Texas Department of Public Safety’s dream of capturing a full set of fingerprints from every Texan with a driver’s license or state ID card in the next decade. 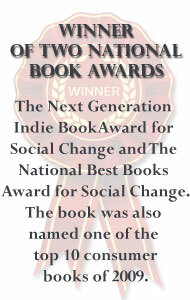 The plan was to include us in a state and ultimately, a national database. The Watchdog first reported the fingerprinting scheme last year. In February, Taylor and Laubenberg met with DPS Director Steven McCraw and DPS’ top lawyer to talk about ending the program. Laubenberg met with House Speaker Joe Straus. Taylor met with Lt. Gov. Dan Patrick and Gov. Greg Abbott’s chief of staff. Under fire, McCraw stopped the program. To make it stick, though, a new law was needed. 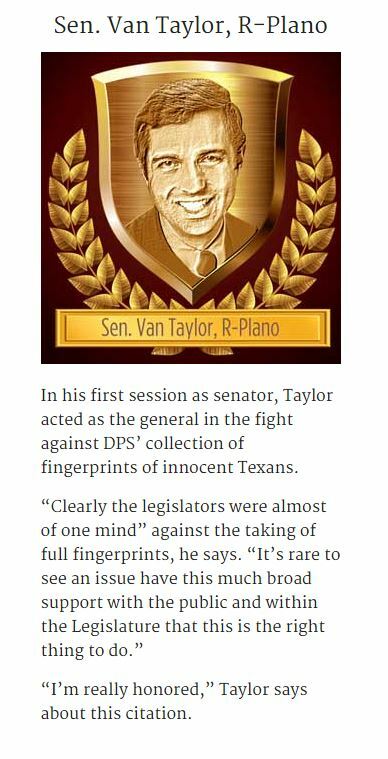 Laubenberg, Taylor, Schwertner and rookie Rep. Tony Tinderholt, R-Arlington, tried various maneuvers to place into law that only a thumbprint is required. They also wanted DPS to destroy the hundreds of thousands of fingerprints collected during the one year the unauthorized collection took place. Taylor, a rookie senator, added a Senate amendment to a bill about commercial driver’s licenses. The amendment enacted the thumbprint rule and also required that fingerprints collected from innocent drivers be destroyed by the end of the year. When that bill got to the House, its author, Capriglione, agreed to let the added portion of the bill stand. It passed. I’ll be watching for your ideas about consumer matters you want to see fixed in the 2017 session. We’ll battle together. Onward and upward. Thanks to Michael Hogue of DallasNews.com for designing our Hall of Fame plaques.